In the previous article (https://guruparamparai.wordpress.com/2012/08/16/introduction/), we started discussing our guru paramparai. emperumAn sriman nArAyaNan who is sriya:pathi (husband of sri mahAlakshmi), one who lives eternally in srivaikuntam with his divya mahishis (sri, bhoo, nILA dhEvis) where he is served by nithysUris like ananthan, garudan, vishwaksEnar, etc is full of auspicious qualities. Srivaikuntam (paramapadham) is a place of eternal bliss, but when emperumAn is enjoying there, his heart is with the jIvAthmAs in samsAram (since they are suffering there). All jIvAthmAs, a) nithyan – always in paramapadham (never been to samsAram due to karma), b) mukthan – one who was in samsAram but liberated now and c) badhdhan – one who is in samsAram bound by karma, are subservient to emperumAn and have the same relationship with emperumAn (owner – owned and father – son relationships primarily). It is out of this relationship alone emperumAn is helping all badhdha jIvAthmAs constantly to bring them to srIvaikuntam and engage them in eternal kainkaryam. emperumAn took the form of nArAyaNa rishi (AchAryan) in badrikAshramam and revealed thirumanthram to his own avathAram Nara rishi (sishyan). emperumAn revealed dvaya maha manthram to periya pirAtti (sri dhEvi nAchiar) in vishnu lOkam (thus starting our srivaishnava guruparamparai). emperumAn, as pArtha sArathy, revealed charama slOkam to arjunan in kurukshEthram. 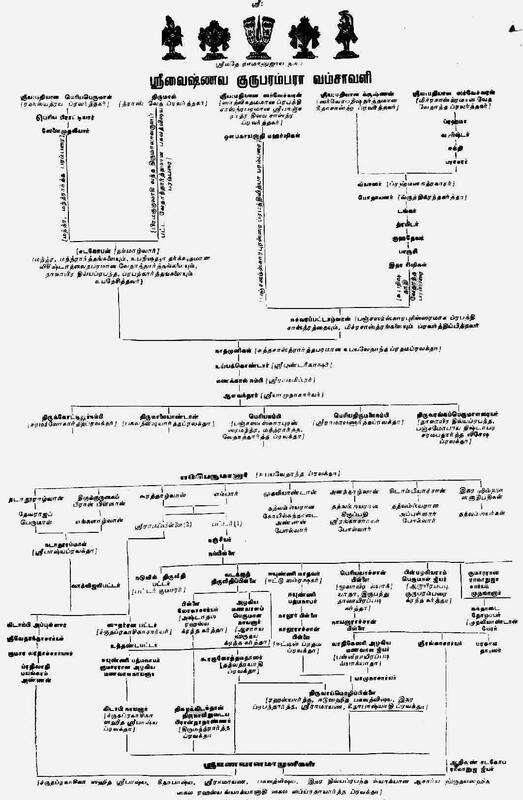 View comprehensive guru paramparai chart: http://kaarimaaran.com/downloads/guruparambarai.jpg. In the subsequent articles, we will go through the lives of these AchAryas as much as possible. This entry was posted in Introduction and tagged acharyas, alwars, guru parambarai, srivaishanvam on August 17, 2012 by sarathyt.